I was very pleased this morning with how Seacookie performed. He was very well behaved and stayed relaxed despite the rain. One of his flying changes was a little unsettled and he got a bit stuck in his pirouette. He scored 46.5 and sits in3rd place at this early stage, just one mark behind leaders Ruth Edge (Rogersdale) and 0.3 marks behind second placed Jonathan Paget (Clifton Lush). It was quite interesting to see his marking as there was a massive discrepancy between the judges, with C scoring 64%, M scoring 74% and E somewhere in the middle. Whilst it is very easy to be disgruntled with the low one, you have to be happy with the high one and overall the marking has been quite erratic. At the moment it is raining quite hard but the forecast is for improving weather so it is very hard to know how the ground will end up on Saturday. The course looks as big as ever with lots of jumping efforts and ditches and many of the more difficult combination fences coming early on in the course. Parklane Hawk will do his dressage at 4.25pm tomorrow (Friday). Keep up to date with the latest scores from Burghley by clicking here. Don’t forget to click here to upload the smart phone App and you can watch all the dressage tests published on Burghley.tv by clicking here. 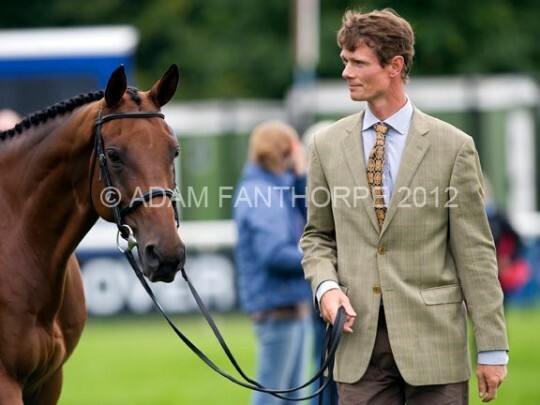 William & Seacookie during yesterdays trot up at Burghley. Huge thanks to Adam Fanthorpe/Brotish Eventing for the great picture.